The Japanese Buddhist monk Eisai (1141-1215) introduced the Zen Buddhist Rinzai sect to Japan, and under him Zen first became acknowledged as an independent school of Buddhism. He is also responsible for popularizing the cultivation of tea in Japan. Also known by his honorific title of Zenko kokushi (national teacher), Eisai came from a family of Shinto priests in the district of Okayama. Like many famous priests in his period, he studied at the great Tendai center on Mt. Hiei. In 1168 he made his first trip to China, where he visited Zen centers, especially those flourishing on Mt. T'ien-t'ai. He was much impressed by what he saw and felt with growing conviction that Zen could greatly contribute to a reawakening of Buddhist faith in Japan. In 1187 he undertook a second trip to the continent for the purpose of tracing the origins of Buddhism to India. The authorities, however, refused him permission to go beyond Chinese borders. He studied on Mt. T'ient'ai until 1191, where he was ordained in the Rinzai (Chinese, Lin-ch'i) sect and returned to Japan. He constructed the first Rinzai temple, the Shofukuji, at Hakata in Kyushu. Eisai proclaimed the superiority of Zen mediation over other Buddhist disciplines, thus provoking the ire of the Tendai monks who sought to outlaw the new sect. However, Eisai enjoyed the protection of the shogun Minamoto Yoriie, and in 1202 he was given the direction of the Kenninji in Kyoto. 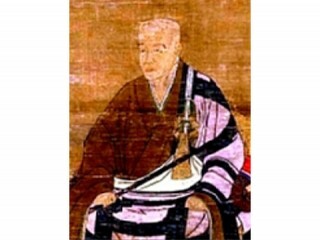 Like Saicho, and particularly Nichiren, Eisai associated his type of Buddhism with national welfare and promoted Zen by publishing a tract entitled Kozen Gokoku Ron (The Propagation of Zen for the Protection of the Country). But Eisai was constantly obliged to face Tendai and Shingon opposition. As a compromise, Eisai conducted the Kenninji not as a purely Zen establishment but also with places for Tendai and Shingon worship. Indeed, he continued to recite Shingon magic formulas. Shortly before his death, Eisai established by government order the third Zen monastery at Kamakura, the Jufukuji, and the close relationship of Zen with the military caste dates from this time. Although tea had been introduced to Japan about 800 by Buddhist monks who had gone to China, its cultivation and consumption were not widespread before Eisai's time. Eisai, returning from China in 1191, brought tea seeds with him and planted them near Kyoto. In 1214 he composed the Kissa Yojoki (Drink Tea to Improve Health and Prolong Life), in which he set forth the hygienic and curative value of tea. Tea was considered an important adjunct to Zen mediation, for it acted as a mild stimulant against sleepiness. A discussion of Eisai and excerpts from his writings may be found in Ryusaku Tsunoda and others, eds., Sources of the Japanese Tradition (1958). A good book on the history of Zen is Heinrich Dumoulin, A History of Zen Buddhism (trans. 1963). View the full website biography of Eisai.